Probing the heart beat of molecules in a liquid sample. A team of scientists around Prof. Theodor W. Hänsch and Dr. Nathalie Picqué at the Laser Spectroscopy Division of the Max Planck Institute of Quantum Optics (Garching), in a collaboration with the Ludwig-Maximilians-Universität Munich and the Institut des Sciences Moléculaires d’Orsay (France) now report on a new method of rapidly identifying different molecular species under a microscope. 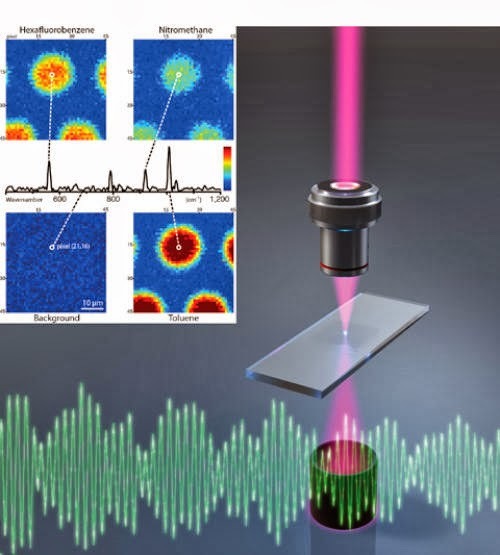 Their technique of coherent Raman spectro-imaging with two laser frequency combs takes a big step towards the holy grail of real-time label-free biomolecular imaging ("Coherent Raman spectro-imaging with laser frequency combs"). How does a drug influence a living cell? In which way can signal molecules change the cell metabolism? Such questions are difficult to answer, since cells are highly complex “chemical factories” which constantly manufacture and break down a large number of different molecular species. Biologists have learnt to attach fluorescent dye labels to certain proteins so that they can distinguish them under a microscope. However, such labels can alter the cell functions. Many molecules of interest have characteristic absorption spectra at mid-infrared wavelengths, but such long wavelengths do not allow for good spatial resolution. Coherent Raman spectroscopy has long been used as an alternative for highly selective label-free imaging. Nonlinear Raman effects provide spectroscopic characterization of the fundamental or low-lying vibrational energy levels of the interrogated molecules. They have the distinguishing advantage of exploiting near-infrared or visible lasers, thus offering high spatial resolution and three-dimensional sectioning capability. Scanning Raman microscopes mostly focus on a distinct spectral feature of a selected molecular species so that they can provide images quite rapidly. However, for the analysis of a complex mixture of molecules with possibly unknown components, a complete Raman spectrum should be recorded for each image pixel. Existing techniques have been much too slow to accomplish such a feat. The MPQ scientists have now shown that, using two laser frequency combs, complete well-resolved Raman spectra can be measured on the microsecond timescale. Laser frequency combs are the key to such achievements: by quickly changing the time-delay between pump and probe pulse without moving parts and sampling of the intensity variations of the generated blue-shifted coherent anti-Stokes signal, which are modulated at the molecular vibration frequencies, the rapid acquisition of a broad Raman spectrum is enabled. Furthermore, the technique only uses a single photodetector for the measurement of a complete spectrum. “Replacing the detector by a camera would make real-time hyperspectral imaging possible, as we could simultaneously measure as many spectra as there are pixels on the camera”, adds Takuro Ideguchi, doctoral student in the group. The scientists expect that their proof-of-principle experiments open up new opportunities in spectroscopy and imaging. With further system development, they plan to explore the potential of their technique for observation of biological samples. “It is exciting that a tool like the laser frequency comb, initially developed for frequency metrology, is finding interdisciplinary applications far beyond its original purpose”, concludes doctoral student Simon Holzner. Max Planck Institute of Quantum Optics. "Watching the heartbeat of molecules." ScienceDaily, 17 Oct. 2013. Web. 21 Oct. 2013.